Many tatting shuttles have a pointy* end, which is useful for picking out a stitch or two, or pulling loose a picot that tightened down a little too much, but sometimes that useful pick becomes a tiny dagger. When you’re tatting at full speed and suddenly get stabbed by a poorly placed thrust of the shuttle, it is easy to let slip vocabulary not fit for small ears. If the pointy part has a curve, keep the curve always pointing downward. Face the pointy end backward—toward the hand holding it, not the working thread. Check your finger position when holding the shuttle. Your fingers should be in the middle of the shuttle (at the highest and lowest points of the arch) for greatest control. Position the thread so that it is coming out of the back side of the shuttle on the side opposite you. 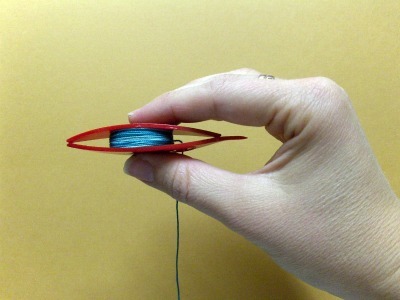 This will find you fussing with the thread less, and using the shuttle more reliably. Slow down a bit. 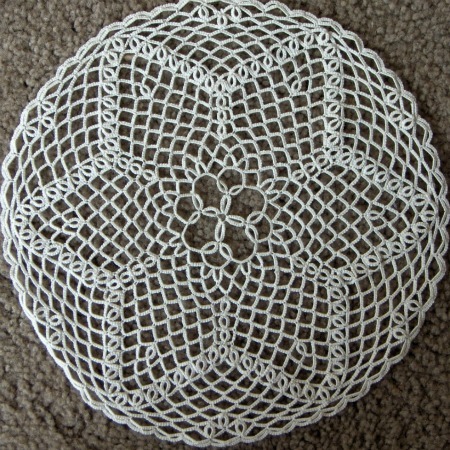 Tatting too fast can hinder your precision. If these techniques don’t significantly reduce the number of punctures in your hands, you could file the tip a bit or try another shuttle. One not bearing built-in blades. *How about a hook? Shuttles with a hook often catch thread whether you want it to or not, and these same suggestions can help. Hold the hook downwards and pointing backwards (into the hand that is holding it), with fingers in the middle, thread coming out the back opposite side, and go slower. Thanks for the suggestions about this the Clover points can be quite sharp! Shell, the Clover shuttles are great for beginners as they are a small investment to see if you will keep going, but most people I know have transitioned to others before long. I’m glad you found shuttles you like. Hmm, I’ve been thinking about this for a few days and haven’t come up with anything. My only thought could be that it was once a hook that someone clipped off, which if done right might look a bit like a screwdriver, though I expect you would have picked up on that and I can’t imagine why anyone would do that anyway. I’m at a loss, sorry. Oh that is so smart of you… Thanks a lot! Heather, Your site and instructions are so excellent! 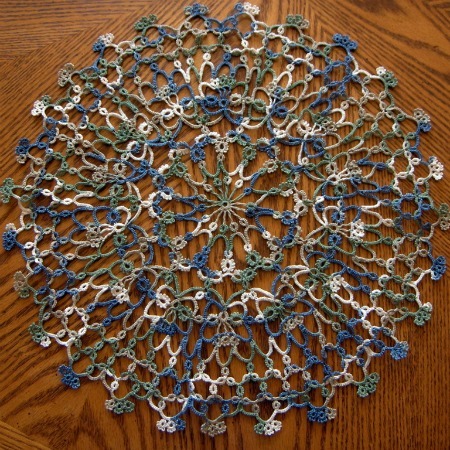 I am loving reading things of interest to me, but then found your explanations about everything tatting to be so CLEAR! So I’ll be viewing every word from now on. Also, I can’t thank you enough for being willing to talk about your visual exploits. The very first thing that I thought when I saw your blog initially was, ‘how wonderful the background color is, so much better for me to be able to read ..i think I love this lady!! !,’ and then reading your explanation just floored me. I’ve been doing all these kinds of things without even knowing why! I’ll definitely be bringing this subject up during my next eye exam!! Perhaps you’ve heard of my daughter Leah’s blog(Chimaera Creations) – I’ve been telling people I taught her to tat, but somehow she is able to tat so much better than me, and then laughing it off puzzled. She tats so fast it makes my head spin. I’ve always put it down to internet access(instant access to watching how it’s done) and that her fingers are one whole inch longer than mine. I know the short fingers had no impact whatsoever on my grandmother, so what’s really going on is the visual thing and your tip about not looking at what you are doing is exactly what I’ve ended up doing on my own. Reading about your visual problem really helped me to understand what has really been going on in my own case. 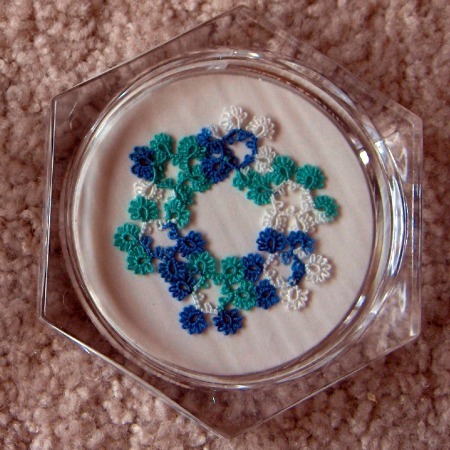 Now, I am sharing this just in case others, beginners/strugglers might benefit from my problems too (even though I’m an excellent tatter, and have been tatting my whole life), so beginner’s shouldn’t be discouraged until (/or ever) they can really identify what is going on in their personal progress with tatting and what would make the process go more smoothly for them. Certainly there is some initial getting used to your fingers being in that position. Try a different shuttle, needle or hand position. There are so many variables and you need to find out what works for you!